I'd read about this monument in the tourism booklet on Bijapur a year ago and the day to see it finally arrived. This turret was the last spot on our list for the day. 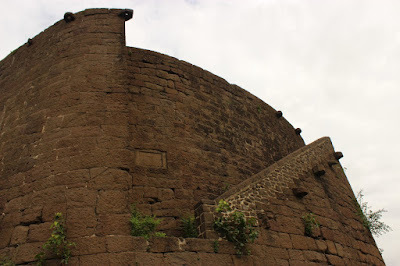 We drove through bad side roads of Bijapur to reach the northeast part of Bijapur fort i.e. 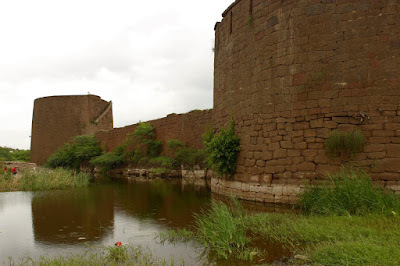 behind Gol Gumbaz. 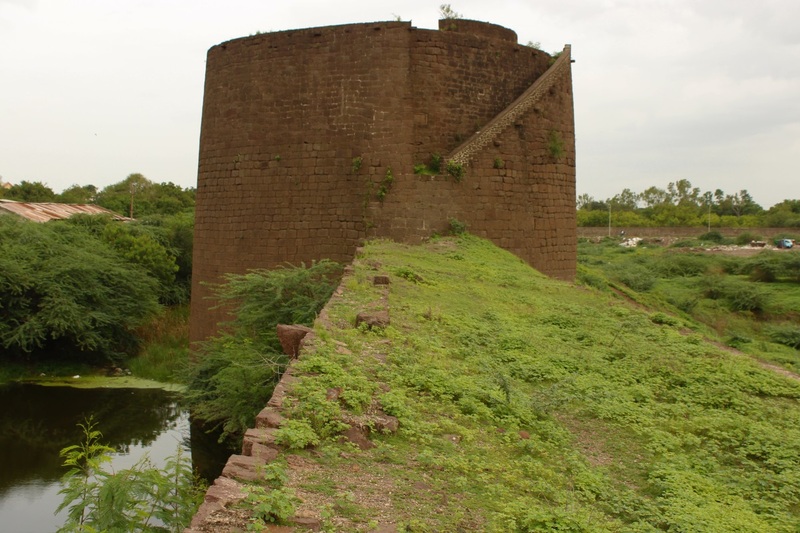 The turret is truly massive.. much higher than Upli Buruj and greater in diameter in comparison to Badi tope Buruj of Bidar fort. This is the view of it as seen from outside the fort, from the bridge across the moat. As you see, the turret's condition is pretty good. 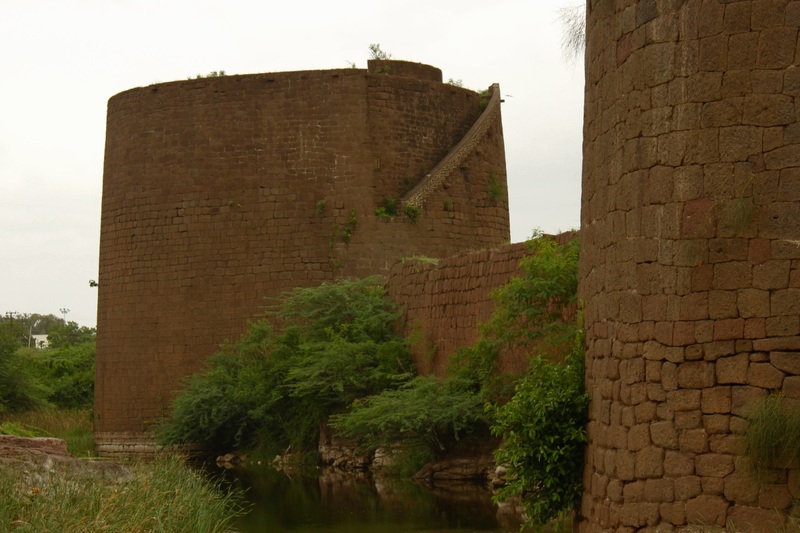 This is the neighboring bastion, seen in the foreground in the previous picture. Check out slots in the wall.. for gunners to fire at enemy forces. 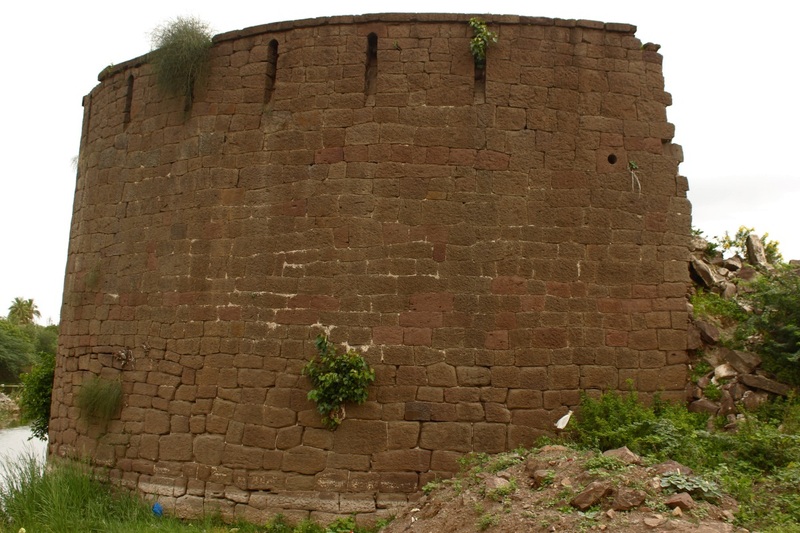 Though it looks well preserved in this view, this structure has deteriorated. 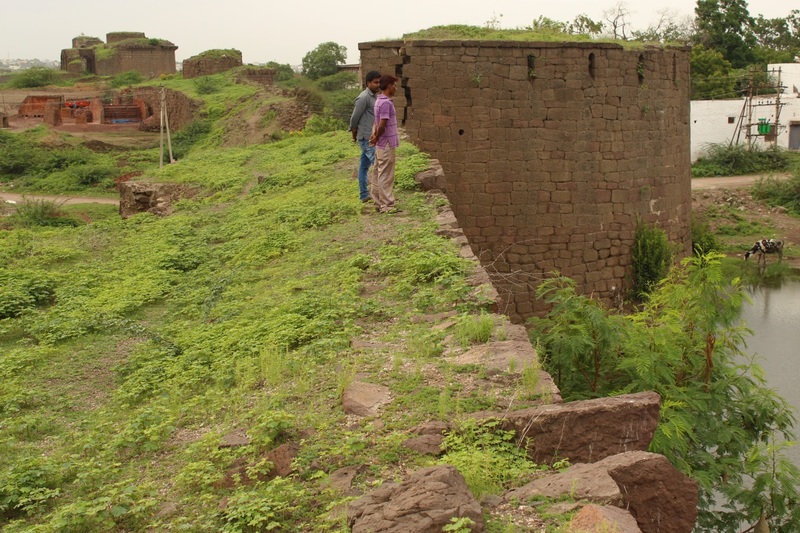 Looks like the bastion was damaged when the rampart wall was demolished to make way for the road. However, these ancient structures are still strong, with little care they will make good tourist spots. Check out the circular hole on the right side of the wall. Wondering if its a rain water drain. I made up my mind to reach the turret for a closer look. Except for the weeds, the surface was fine. View of Aldi Buruj from the rampart wall. On the turret is a semicircular wall.. the cannon swivel stopper. Its confirmed there's a cannon out there but no view of the cannon from here. 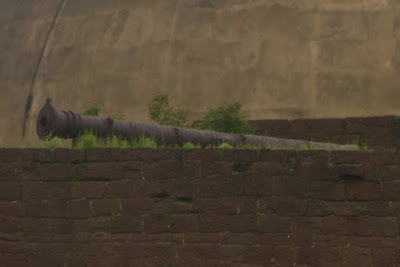 The cannon is known as Aldi Buruj Tope. I ventured right upto the structure. The base of the stairway was a good 15 feet from the my feet and not much of a hold too. Even if I climbed up, climbing down would be impossible without a rope or a ladder. Well.. hoping there's another time. So, I turned around to go back.. I was surprised to see people so close by.. I'd not realized them coming up here. They were local folks. One of them said that dared to ventured here after seeing me up here. In fact they had seen me on the bridge and then coming up. It seems he wanted to explore this but never got the courage because of the stories floating about a huge serpent around this spot. It seems they had checked out the base of the turret and found no stairway from there. He said a part of the stairway might have collapsed. Then we spoke of the cannon. 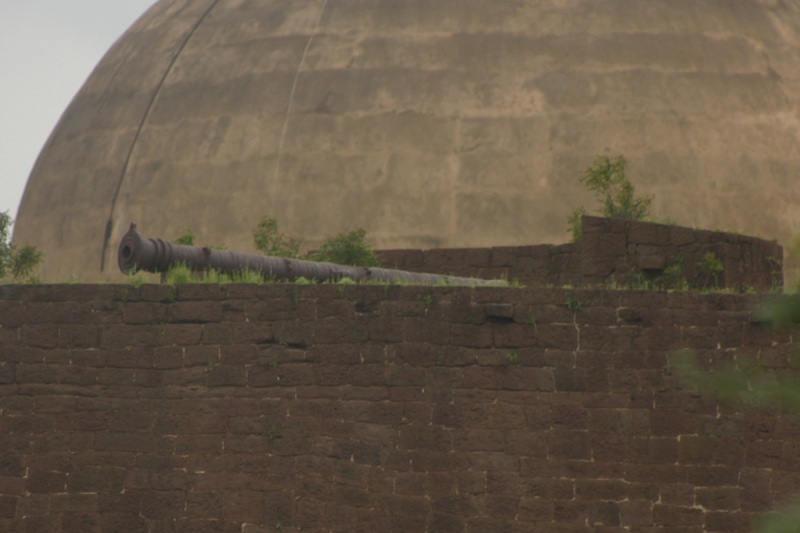 I said the cannon might be as large as Landa Kasab Tope.. the young man said no, it a smaller one and it can be seen if moved to higher ground outside the fort. He pointed to a spot close by. I thanked him for the info. If not for them, I might have missed seeing the cannon. 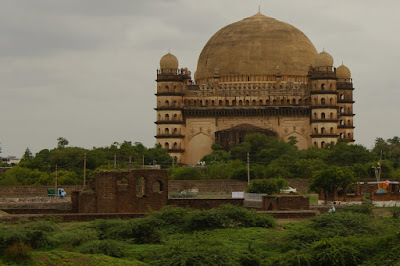 While on the rampart, a view of the wonderful Gol Gumbaz. What an imposing structure. We drove out of the fort and reached a spot slightly higher than bridge. The cannon came into view :) Yes, the young man was right. The cannon is smaller, about the same size as the cannons on Upli Buruj.. may be slightly larger. I got two shots, here's a zoomed in view of it. The cannon is well preserved and it has a gunner sight too. Thanks again to those people. Having traveled the entire day with lot of stops in humid weather was tiring. I just wanted to park the car, check into some place and take a nice cold bath. 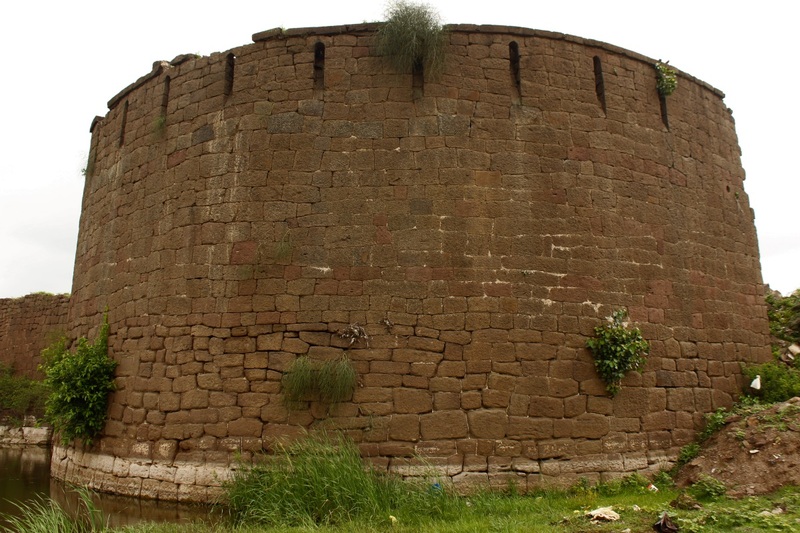 Pushpa did the searching and we decided on Sabala Heritage Home situated off Bijapur by-pass road. The resort was about 3.5 kms from Gol Gumbaz. We liked the place.. anything was fine from the dusty main streets of Bijapur. The resort owner, a lady was friendly and passionate about farming. We checked into our room, it had a rustic setting. The bed had a mosquito net over it.. peaceful sleep guaranteed. The view from the window had nothing but farm land. A hot cup of lemongrass flavored tea refreshed us. The cold water bath was refreshing. Then it started raining, perfect end to end a day. Dinner was fresh jolada rotti oota, it was home food :) We hit the bed early..
Nice to know about this turret and cannon.